Classic recipes have developed over hundreds of years, originating from wood-burning or coal-fired kitchens, where cooking on an open flame was the norm. It’s hard to remain true to that taste without a fire licking the bottom of the cooking vessel – or even the food. But on cruise ships, this is simply not possible. On a majority of cruise lines, health and safety laws ban open flames in kitchens, with the exception of crème brulée torches, although even these can only be used in certain areas of the galley next to the fire extinguisher. Like other cruise ship jobs, being a chef on board calls for strict adherence to safety rules as well as compensation for these drawbacks in other ways. So chefs often adapt recipes to electric-powered induction heat sources. Compared to electric stoves, gas stoves typically respond more precisely to temperature adjustments and obviously heat instantly. To keep up with the numbers on board, using gas stoves would be ideal. 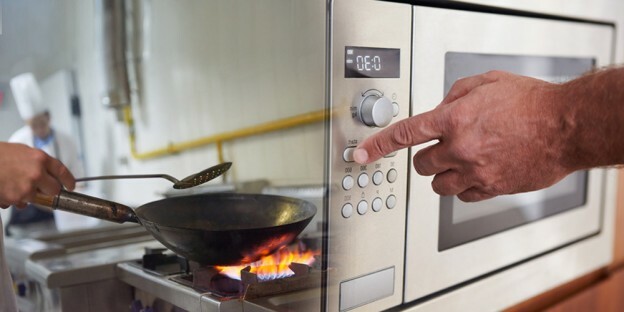 Instead, cruise ship chefs now ensure they accurately calculate how early to put a pan on the electric stove to heat up, and what dial position on the hob offers the heat closest to what they’re looking for. Even barbecue sets are now available in electric versions so on board menus do include this classic summer option. Today, liquid smoke – some even with hickory flavour – offers a safe, consistent and quick option to firing up an open pit. While there’s nothing quite like low and slow cooking with real wood smoke, cruise ship chefs can get away with a few cheats while still serving guests what they want. It’s hard to broil a meal in an electric oven so chefs often miss out on that beautiful unevenness that lends itself to the dish. However, electric stoves and ovens are easy to clean, which is essential in a cruise ship galley, and also offer an even surface which are more stable for pots and pans compared to stoves with coil-elements. Both types of stoves have their pros and cons, but with the option of only electric stoves, cruise ship chefs often come up with innovative ways to make sure their guests don’t miss out on everything nice. This entry was posted in Cruise Life on February 29, 2016 by admin. Cruise chef jobs: A Perpetual Vacation? The world is full of beautiful places, yet virginal sands and azure seas have long been an enticing attraction for cruise liners. Cruise chef jobs can call for seemingly endless, hard days behind a kitchen platform, but no other industry provides as much travel as cruising does. The modern cruise industry kicked off in the 1960s when cruise liners offered ‘fun ships’ to the Caribbean for vacationers. Ever since, the area has continued to draw sailing holidaymakers and along with it the crew that makes the cruise ship their home. In the Caribbean, there are a host of islands, each one as exquisite as the next. Aruba, Barbados and the Cayman Islands are common on itineraries. Antigua and Barbuda, the Bahamas and the Virgin Islands see a constant stream of tourists. Popular ports in the Caribbean include Nassau and CocoCay in the Bahamas, Belize City in Belize and Cozumel in Mexico. When not working, cruise ship chefs can enjoy basking in the warm tropical waters, an excellent array of local fare and adventure sports activities. Most guests prefer to take a trip inland and see the sights, thereby skipping lunch on board, which gives some crew a bit of free time. In North America, Alaska is a popular destination for cruise ships. Thanks to its jaw-dropping scenery, raw natural beauty and icy glaciers, the region boasts excellent photo opportunities despite the cold. Juneau, Victoria on Vancouver Island, Glacier Bay and Tracy Arm Fjord are marvellous spots to spend a day off when at work. Cold cruises are not popular just in Alaska, but in Scandinavia as well. The land of the Vikings offers pretty villages, sparkling white landscapes, and a chance sighting of the kaleidoscopic Northern Lights. The fjords of Norway, Stockholm, St Petersburg and Copenhagen see many passengers alight at their ports. Further along in Europe, the summer invites thousands of cruise ship guests to the Mediterranean coast. History and food are the mainstays here, although the beaches and other local attractions do not drag along too far behind. Athens and Santorini, Barcelona, Dubrovnik, Istanbul, Lisbon, Rome and Venice, Valletta and Villefranche-sur-Mer present a colourful addition to your picture postcard collection of holiday images. In the East, cruises are now venturing more frequently to ports such as Hong Kong, Macau, Bali, Shanghai, Busan, Cochin, Bintulu, Yangon, ports in New Zealand and Dubai. An increasing number of guests are now travelling Eastwards, and with many cruise ship chefs hailing from this region, it presents the warmth of feeling of being closer to home. Wherever it is, having cruise ship jobs can seem like a perpetual vacation, what with the beautiful ports of call of each cruise line. Between shifts at work, crew can enjoy time off in some of the most beautiful coastal places on Earth. This entry was posted in Cruise Life on February 15, 2016 by admin.